PaperAdmin is a free Bootstrap Angular JS 4 admin dashboard template. It contains custom features like calendars, pie chart, custom cards, and list views with CRUD(Create, Read, Update, Delete) functionality.Data and basic tables with edit functionality also in the box. Besides, a sticky top bar and sidebar navigation makes browsing easy. 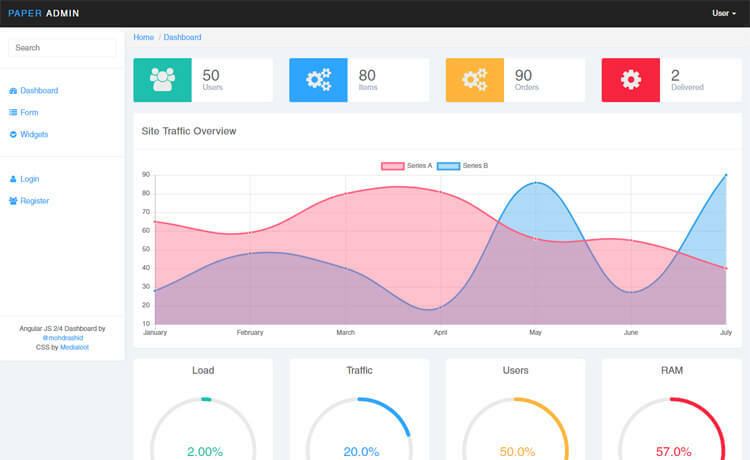 PaperAdmin is a free Bootstrap Angular JS 4 admin dashboard template. It contains custom features like calendars, pie chart, custom cards, and list views with CRUD(Create, Read, Update, Delete) functionality. Moreover, it is fully responsive and has a clean & minimal single page design. Two authenticating pages are there with PaperAdmin. Line, pie and bar charts are included with PaperAdmin. Data and basic tables with edit functionality also in the box. Besides, a sticky top bar and sidebar navigation makes browsing easy. An intuitive and flexible code will help you to develop quickly and effectively. Thank you for downloading PaperAdmin. Here are three recommended free Bootstrap Angular JS 4 admin dashboard templates.